Hyderabad, Capital of Telangana is a one of the populous city in India. This city has very rich history. There are Number of Central Board of Secondary Education (CBSE) affiliated schools in Hyderabad. School study plays a vital role in shaping skill and carrier. This attracts Big Brands to establish their branches in this city. Our list comprises the list of Top 10 CBSE Schools in Hyderabad based on some specific factors such as Academic performance, Rank of the School, etc. This “Top 10 CBSE School list” aims to help parents choosing a Best school in this City. Global Indian International School Hyderabad was established on 2002. It is a Singapore based School. This school is a co-managed school with Hyderabad based ARCA Education Society. This school affiliated with Central Board of Secondary Education (CBSE), International General Certificate of Secondary Education (IGCSE) and International Baccalaureate (IB). This School also operates in Singapore, Malaysia, Japan, Thailand, Vietnam and UAE. Global Indian International School (GIIS) is placed in the list of “Top 10 CBSE Schools in Hyderabad” because of its versatile programs, strong curriculum, popularity and strong commitment towards society. Global Indian International School (GIIS) Hyderabad stimulates multiple intelligence among their student to develop their talent through Concept teaching, Co-curricular activities and Extra-curricular activities. This school has excellent academic record since its inception. This school equally focuses on skill development activities apart from study. Global Indian International School conducts events to promote Science, Singing, Music, Sports, Dance, and various other activities. Campus: In its 6 acre campus Global Indian International School (GIIS) has constructed a world class infrastructure. School campus incorporates Lawn Tennis court, Cricket ground, Volley ball field, Basket ball court, Skating link, Swimming pool, Football ground, Table Tennis court, 200 meters Athletics track, Canteen and Conference Hall for meetings. Facilities: Schools WiFi enabled campus has build infrastructure at par with International standard. Class rooms are equipped with latest multimedia hardware. Science and other laboratories also meets the International standard. Awards: School has won total 59 National and International awards for Innovation and excellence in school education. This School was founded in 25th Nov 1972. Kendriya Vidyalaya School mainly takes student from Central government employees. Objective of this school is facilitate education, sports and to develop innovation and required skills among its students. Kendriya Vidyalaya is affiliated with Central Board of Secondary Education (CBSE) and National Council of Educational Research and Training (NCERT). International commerce Olympiad: From Class XI 33 students participated out of which 3 got merit certificates. CMP CULTURAL EVENT: First Position In Group Dance Competition. CMP SPORTS MEET: First Position In Kabaddi Girls , Kho Kho Girls ,Kho Kho Boys And Second Position In Kabaddi Boys. Best School Award: Recently it awarded by Indian Development Foundation for Social Activities. Make A Difference Award: KV1 Uppal bagged 1st position and Best School Award among all the 10 schools participated in Train Green Programme conducted by HSBC. Facilities: Kendriya Vidyalaya No. 1 has equipped with modern facility. It has developed e-class rooms with e-learning software. It has a huge library and computer laboratories. It also has well equipped Science Laboratories. Admission Procedure: Kendriya Vidyalaya enrolls student from Class I to XII. The complete admission procedure conducts with transparency and available online. Please visit Official Website for admission. Durgabai Deshmukh Mahila Sabha (formerly Andhra Mahila Sabha) – P Obul Reddy Public School is one of Top CBSE schools in Hyderabad. This school was founded in 1989. Till then this school have achieved so many feats. 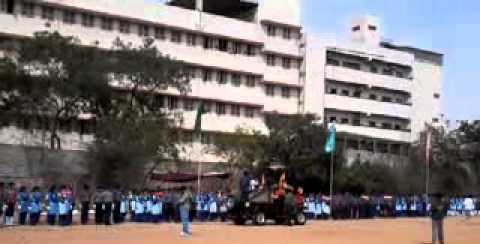 P Obul Reddy Public School is a popular CBSE school in Hyderabad. This school also considers economic condition of students. P Obul Reddy Public School has got affiliation from Central Board of Secondary Education (CBSE). It has nice curriculum record since establishment. P Obul Reddy Public School also engages itself in social activities like uplift of backward groups. P Obul Reddy Public School is placed in Top 10 CBSE Schools in Hyderabad because of its consistency in performance and for its extracurricular activity. This school gives emphasis on overall development of its pupil. Campus: P Obul Reddy School has a big campus. Apart from well ventilated class rooms it has Libraries, Laboratories, Computer Laboratories, Art & Craft Laboratory, Music Laboratory, Auditorium, Sports Complex, Infirmary, and Cafeteria. Facilities: School Library has huge stock of books. It has well equipped laboratories, latest computer systems, enabled digital learning rooms, and other co-curricular activities. Bagged 2nd Prize in Energy Conservation awards (WEECA)in Hyderabad to recognize and reward the schools that help build a greener world. Jubilee Hills Public School a renowned CBSE school in Hyderabad is founded by “Jubilee Hills Education Society” in 1986. It got affiliation Central Board of Secondary Education (CBSE) in the year 1991. This CBSE school in Hyderabad emphasize on high quality education with overall personality development through academic excellence and developing important skills among its students. This school follows the principle of high quality education with affordable fees. Jubilee Hills Public School, Hyderabad develops and nurtures creativity and injects sense of social responsibility among students. Campus: Jubilee Hills Public School is spread across 6 acres. Its campus includes Play ground, two covered auditoriums, well ventilated class rooms, Library, Laboratories, and dance and music rooms. Facilities: Important facilities like Internet, latest computer systems, Medical rooms, Canteen, Gym has been installed at schools. Co-curricular activities like Dance, Music, Art & Craft are given importance in this school. Award won: Jubilee Hills Public School has won ‘Use of ICT in School Management’ presented by ‘Digital LEARNING Magazine’. Oakridge International School Hyderabad was founded in 2001 and counted as one of the top CBSE Schools in Hyderabad. The aim was to promote smart education. The school was established by Educationalist Shomie Das and inaugurated by then Chief Minister of the state Shri Chandra Babu Naidu. Since inception Oakridge International School Hyderabad is regarded as one of the best schools. This school has affiliation from International Baccalaureate (IB) and follows both International General Certificate of Secondary Education (IGCSE) and Central Board of Secondary Education (CBSE) syllabus. Its curriculum help students to gain indigenous as well as global perspective in different aspects. Campus: Oakridge International School Hyderabad spreads across 10.5 acres. Foot ball ground, Tennis court, Swimming Pool, Amphitheatre, Digital Class rooms, Learning resource centers, Audio Visual rooms and Laboratories are situated in its campus. Facilities: International programs for students, Literary activities, Art and Cultural activities, all popular sports coaching, fitness education, periodic trip and expeditions, renowned guest teachers lecture are its extra ordinary strength. Awards and Accolades: Featured as best Indian Schools by Forbes Magazine. Best school in Times School Ranking. Established 1989 Chirec International School Hyderabad has garnered many honours apart from being one of the top 10 CBSE schools in Hyderabad. This is one of the best International Schools in India. It is placed among “Top 10 CBSE schools in Hyderabad” due to its consistent performance and quality of education. This school follows three syllabuses namely Cambridge International Examinations (CIE), International General Certificate of Secondary Education (IGCSE) and Central Board of Secondary Education (CBSE). This school has very good academic record. Chirec International School Hyderabad prepares its pupil to face global challenges and prompts them to take independent decision. It also teaches students to think extra ordinary and enriches ethical value among students. Campus: Chirec International School maintains a spacious campus which includes Classrooms, Laboratories, Library, Open-Air Auditorium, Multipurpose Halls, Playgrounds, Dining, etc. This school gives emphasis on Green initiative and has set up a Solar Power generator inside its campus. Facilities: Beyond academics Chirec International School focus on add on activities like Art and Sports. Students of Class VI to X are bound to choose club activities like Drama Club, Orators Club, Culinary Club, Cinematheque Club, Science Club, Photography Learning Club, Kiddo Gardener/ Urban Eco Lab, Better by Design, Tourism Club, and Creative Writing Club. There are also Community Service, Events, Exchange Programs, Excursions, and Innovative Programs which are designed for students. Orchids The International School a top CBSE School in Hyderabad uses Dr Howard Gardner’s multiple intelligence theory to develop student’s dominant learning modality. This school follows a Curriculum that has won awards. It has truly adopted Multiple Intelligent Theory. Orchids Internal has 18 branches all over India. Activity and project based learning technique make the study more interesting for its students. The first school launch by Orchids International was in Hyderabad in the year 2002. Campus of Orchid International fully equipped with State of art Laboratories. This school uses smart classes to empower its students. Latest technology and well maintained study aids encourage students to give their best. Students are encouraged here participate in activity of their choice. Swimming, Skating, Dancing, Music are taught here. Its 1 acre campus comprises Basket ball court and Kids play area. Delhi Public School (DPS) Hyderabad is a top CBSE school with proper vision. Delhi Public School is one of oldest School chain in India. It started its operation in 1949. Delhi Public School has more 100 branches in India. Delhi Public School Khajaguda Hyderabad established in 2002. It has got a place among “Top 10 CBSE Schools in Hyderabad”. Apart from following top standards in curriculum this school also steps into various activities which help students to develop other important skills like sports, music, etc. This CBSE school has achieved very good academic record. Campus: Delhi Public School Hyderabad spreads across 6.5 acres. This campus includes Swimming Pool, Indoor game space, Dance rooms, Music rooms, Health and Medical Checkup and space for outdoor sport activity. Facilities: This school is equipped with Science laboratories, latest computer systems, high speed internet connection, audio visual rooms, and amphitheater. It provides coaching in Aerobics, Karate, etc. Sports Award: This School has a good track record in sports. It always wins prize in sports. Bharatiya Vidya Bhavan’s Public School Jubilee Hills Hyderabad was inaugurated by Swami Ranganathanandaji in the year 1979. It is affiliated to Central Board of Secondary Education (CBSE). Since inception this top rated CBSE School in Hyderabad has made tremendous progress in every aspect of education and activities. This school has made remarkable progress in Sports, Art, Literature, Music, Culture, Exhibitions, Quiz etc. It also gives much more importance to Indian culture. Founder of Bharatiya Vidya Bhavan’s Public School was Dr. Kanhaiyalal Maneklal Munshi who was great scholar. With his vision this was school founded to give uplift to education system. Facilities: Bharatiya Vidya Bhavan’s Public School has a state of the art Computer center. It has enabled audio visual classes. Its campus includes Library, Canteen, Laboratories, etc. Co-curricular activities are at focal point. Games, Sports, Trekking, Skating, etc. are part of activity. Play grounds are there to play out door games. This school shows interest in Dance, Music, Art & Craft, etc. Gokaraju Rangaraju Educational Society has founded “Ganges Valley School Hyderabad”. This has got affiliation from Central Board of Secondary Education (CBSE). In very short time span this CBSE school in Hyderabad has excelled in academic, extra-curricular activity and co-curricular activity. They cultivate Indian culture among their students and emphasize on ethical values. They not only focus on academic, this school also works on overall development of students. Ganges Valley School Hyderabad committed to provide quality education at the same time they nurture their students to respect diversity. This makes student confidence in their journey. Overall Ganges Valley School has got a position among “Top 10 CBSE Schools in Hyderabad”. This school follows ethical values and teaches its student to respect core values of life.